The Vlogbrothers annual Project for Awesome proves once again that when the internet and socially conscious millennials team up, there's plenty of opportunity to decrease worldsuck. Each year, Vlogbrothers John and Hank Green hold a charity fundraiser known as the Project For Awesome (aka P4A), which aims to decrease “Worldsuck.” This year, the eighth annual Project — which flooded YouTube with videos lobbying for charitable donation — raised almost $1.3 million. On Wednesday John Green announced in a video which charities won a portion of the funding. Unlike previous years, this year the Project nominated two charities to take 50 percent of the funding: Save the Children and Partners in Health received more than $700,000. 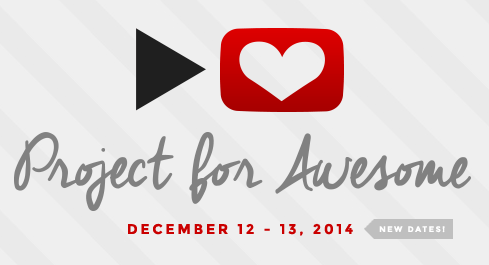 The rest of the money will be distributed to charities chosen by participants in the Project for Awesome. They chose by voting on uploaded videos from other users, and the top 10 charities will receive $25,000 each, and the next 10 will receive $10,000. Top ten winners included The Office of Letters and Light, which runs a yearly writing project called NaNoWriMo, Doctors Without Borders, Pencils for Kids, and water charity The Thirst Project. $10,000 grant winners included the American Foundation for Suicide Prevention, Water.org, and Books for Africa. The winning charities were diverse and international, but there seems to be a particular focus on international charities, as well as book and education based initiatives. The P4A ran on the 12th and 13th of December with a 24-hour livestream featuring John and Hank Green and other YouTubers. Additionally an Indiegogo campaign raised money by exchanging donations for perks like a photo calendar of YouTubers before they were famous. The Project is an annual event that follows the new internet institution that is #GivingTuesday. It seems that when the internet and socially conscious millennials pair up, it seems that there’s plenty of opportunity to decrease worldsuck.